Remove chicken to platter and let cool completely. 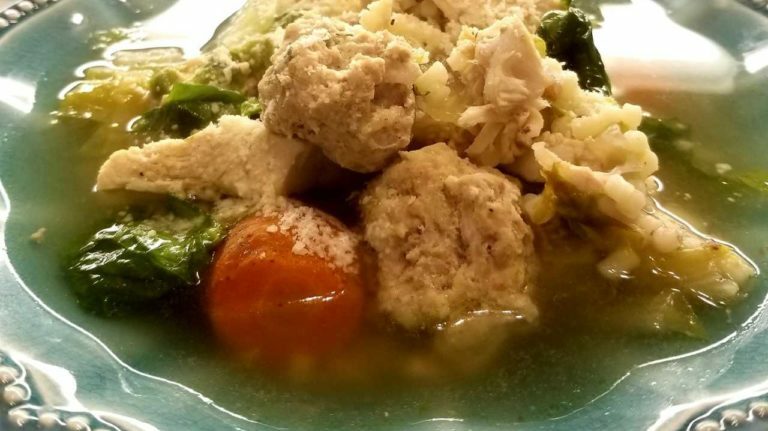 Keep vegetables in soup, or discard Bring broth to soft boil and make meatballs by combining ground chuck, bread crumbs, cheese, garlic, parsley, eggs, and salt and pepper. Mix together well and make tiny meatballs, about the size of large grapes. Drop the meatballs into the hot broth; skim any foam from meatballs as it rises to top and remove. Skin and debone the cooled chicken; cut into small pieces and return to broth. Let the meatballs and chicken cook together about 10 minutes. Rinse the escarole and remove bottom core; chop and add to the broth. Keep broth on soft boil and simmer for 5 minutes. Pre-boil the acini di pepe in boiling salted water for about 5 minutes, drain and add to the broth; simmer an additional 10 to 12 minutes. Taste soup and add any additional seasonings as desired. This soup will have a rich chicken and beef flavor. Ladle soup into soup bowls and garnish with freshly grated Parmesan cheese. Serves 8 to 10.